My first surgery was late and it was after 11 pm before I got back to the hotel room. Took a pain pill and went to sleep. Got up during the night and took another pain pill. After that it was only Tylenol for me. I only leaked a little bit around my ankles. The sensation after surgery is hard to describe. Sore, burning, weird. The first step out of bed I knew there was success. 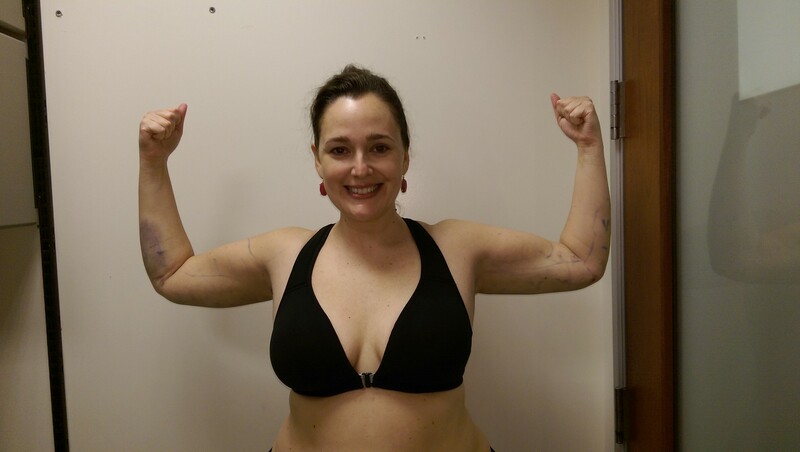 I didn’t have my morning lipedema pain getting out of bed! Instead I had my body adjusting to surgery. The first few movements are the hardest. But otherwise fine. After my post-op appointment, we stopped at Pharmacy 90210 for supplies and then on for lunch. I walked about a mile but then came back to my room for a little nap. I found myself wearing out easily. And it was really warm… In the upper 80s… Heat has always bothered me! Went to bed early since I had a 5 a.m. arrival for surgery # 2. No pain meds and felt really good.